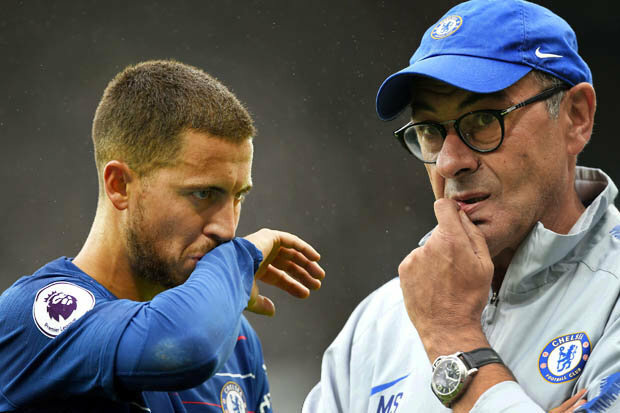 Manchester City vs Chelsea: Maurizio Sarri to revert back to Eden Hazard and the false-nine? This Sunday is one of the biggest games of the season as Chelsea travel up north to take on Pep Guardiola's table topping side. Will Maurizio Sarri switch his tactics and start with Eden Hazard in a false-nine formation? Or will he stick with Gonzalo Higuain? Only time will tell. Preparing to write this post ahead of the game I was surprised to note that Chelsea have not won away from home against any of our five top-six rivals in the last six games. We have drawn two and lost four of them in a row. Chelsea head into the game as 11/2 outsiders as a result. I have to be honest here, I am torn in this one because I could not stand Liverpool winning the Premier League so giving them any advantage by beating Manchester City wouldn't be ideal. However, we must focus on our own battle which is to finish inside the top four and starting with at least a point against Manchester City is a start. Chelsea fans travelling to the game and those watching around the world have to be honest to tell you that they do not know how Maurizio Sarri will approach the game, how he will decide to play tactically and if he will make the same adjustment he did at Stamford Bridge by playing Eden Hazard in the false-nine formation supported by Willian and Pedro. For some there is an argument that we need to protect what we have and the tactical ploy worked earlier in the season as we beat Manchester City 2-0, I for one believe that we should adopt a different approach this time. "We started well with Arsenal and Everton but now comes a really, really big test — a big bull. Chelsea is an exceptional team with seven days to prepare that game. We will try. We have to prepare well. This is a real final for us this weekend. If we are able to take these points, we are going to take a huge step forward." - Source: Football London. We all hope that his perception of Chelsea is the one we see take to the pitch at the Etihad on Sunday. The problem is, based on our season so far, we simply do not know which Chelsea team will turn up. We have been brilliant at times this season and then a shadow of ourselves, slow and laboured, lacking ideas and have been punished by dropping important points along the way against West Ham, Leicester, Southampton, Wolves and Bournemouth who are sides we should be beating. If you then add our two away performances against Tottenham and Arsenal where we were beaten convincingly by offering little then we have to admit that we are concerned. On our day, Chelsea can beat anyone if we play with confidence, play our football and express ourselves in fact 138.com are offering 30/1 on both teams to score. The problem is, against our rivals so far this season we simply haven't seen anything like that. Will we side the Chelsea we all want to see on Sunday? Your guess is as good as mine!